Workbasket Wednesday – The StitchTastic Mug Cardigan – That's StitchTastic! This week’s Workbasket Wednesday comes with a freebie just for you! This week I worked on creating a pattern to go along with my Knitting 101 class. I wanted a pattern where my students could practice all the skills they learned in class, but was a little more creative than a plain square dishcloth. I did search on the internet, but didn’t find a small project that included the Garter Stitch, Stockingette Stitch, and Seed Stitch all in one. So I decided to write one! 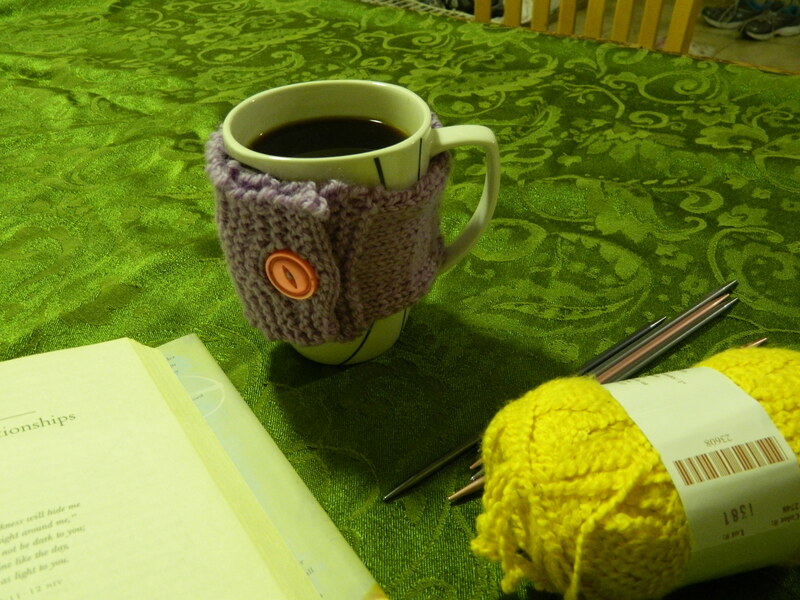 And the result is a pattern for a simple but cute Coffee Mug Cozy. But since this one included a button, I decided to call it a Cardigan. You can preview the pattern on the PDF viewer below! You can click on the link here directly to the pattern to download the pattern and make your very own! Thanks – it’s great. love how it pops up in it’s own little window! Clever!!!! Pingback: Little by Little – Stitch by Stitch – That's StitchTastic!